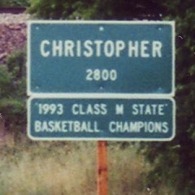 Christopher, Illinois photographs taken in 1994. Greetings and welcome to The Webb Family Site! Our family tree is posted online on this site! There are 341 names in our family site. The site was last updated on Feb 4 2018, and it currently has 20 registered member(s). If you wish to become a member too, please click here. Marcella Webb Brown updated the details of Thomas Dale Bainbridge and Ezra Dale Webb in family tree Webb Family Tree. Marcella Webb Brown added Ezra Dale Webb to family tree: Webb Family Tree. Marcella Webb Brown updated her profile. Marcella Webb Brown updated the details of Dorothy Brown (born Good) , <Private> Brown II and <Private> Mrs. Brian Lane Lauer (born Brown --Mother Wilma Jenkins) in family tree Webb Family Tree. Marcella Webb Brown added Dorothy Brown (born Good) , <Private> Brown II and <Private> Mrs. Brian Lane Lauer (born Brown --Mother Wilma Jenkins) to family tree: Webb Family Tree. Carol Ann Webb-Donaldson updated the details of Lucille Webb and Timothy Adam Webb in family tree Webb Family Tree. Carol Ann Webb-Donaldson added Unknown , <Private> Sniderwin and <Private> to family tree: Webb Family Tree. Carol Ann Webb-Donaldson updated the details of <Private> Webb (Hackett) , <Private> Donaldson (born Webb) , <Private> Donaldson , Unknown and 6 other people in family tree Webb Family Tree. Marcella Webb Brown updated the details of Meredith Gene "Lefty" Webb in family tree Webb Family Tree. Marcella Webb Brown added <Private> Garbes , <Private> Garbes , Ida Webb Brown Cagle (born Newton) and Albert Weaver (William) Brown to family tree: Webb Family Tree. Marcella Webb Brown updated the details of Ezra Dale Webb , <Private> Garbes , <Private> Garbes , Cora Helen Webb (born Oglesby) and 6 other people in family tree Webb Family Tree. Roger Neal Webb updated the details of Sally Webb (born Struman) in family tree Webb Family Tree.